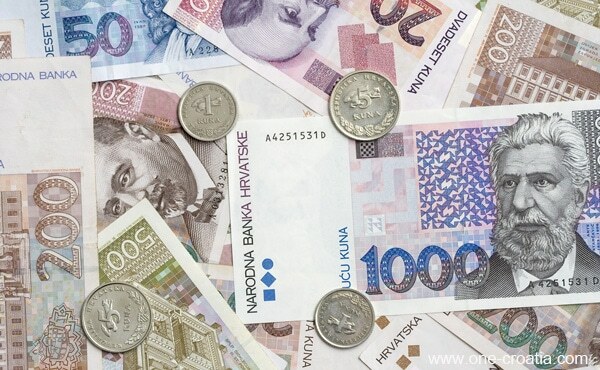 The unit of Croatian currency is the Kuna (HRK). You will see next to prices Kn as an abbreviation of Kuna. ‘Kuna‘ in Croatian means ‘marten‘. This little animal was chosen as the symbol of the Croatian money in memory of a time when we used the marten pelts as units of value. If you wish to benefit of a better exchange rate then you should change your money in Croatia instead of in your own country. You can actually check this information by looking at the rate exchange of the Croatian National bank at http://www.hnb.hr/tecajn/ and compare with what your bank offers. Once in Croatia you can change money at the bank or exchange office at the airport, but if you arrive during the night then you’ll have to get money from an ATM. In this case check with your bank how much money they allow you to get, so that you avoid an awkward situation when the ATM refuses to give you some cash because you passed the limit. As well you should be aware that bigger amount of money you take from the ATM, smaller will be the commission. If you come by car and take the highway, then you will be able to pay in Euros or by credit card at all the toll gates. To convert Euros (or any other currency) to Kunas please use the currency converter on the right side of this page. Even if Croatia is part of the European Union since 2013, it still does not use Euros but only Kunas. Actually more and more places give prices both in Kunas and Euros, to book an excursion or an accommodation for example. Other places like restaurants can accept Euros if you do not have Kunas but be aware that the exchange rate will be unfavourable and your change will be in Croatian kuna. So there is no rule about it, it only depends of the good will of the seller. The marten (in Croatian: kuna) is represented on each coin of the Croatian money. On the other side is represented an animal living in Croatia : nightingale, tuna fish and brown bear. Cents are called ‘lipas’, lipa in Croatian means linden (lime) tree. The linden tree is then represented on one side of each Lipa’s coin, and on the other side is represented plant species of Croatia as: corn, grapevine, oak tree, tobacco, olive and Degenia velebitica endemic plant of the mountain of Velebit . It is rare to get a 1 or 2 lipas coins since it is such a small amount (about 0,001 and 0,002 €) that people use to round up the bill. So if the price of an article is 0,99 kn do not expect to receive 1 lipa back. As well if the price is let’s say 10,51 kn they will ask you for 10,50 kn. Croatian banknotes will tell you more about Croatian history. They represent very important persons and monuments of Croatia. Petar Zrinski (1621-71) and Fran Krsto Frankopan (1643-71). The Old Fort and layout of the old Varaždin castle. The Pula Arena and Motovun town layout. The Eltz Manor in Vukovar and the Vučedol Dove. The Old City of Dubrovnik and its Rector’s Palace. St. Vitus Cathedral in Rijeka and its layout. The old General Command building in Osijek and layout of the City-fortress of Tvrđa. Diocletian’s Palace in Split and the motif of Croatian ruler from 11th century. Statue of King Tomislav and the Zagreb Cathedral.